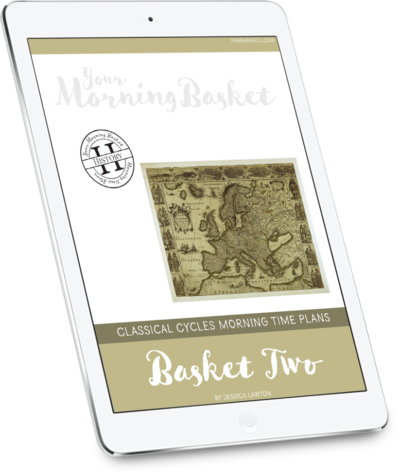 I was compensated for my time reviewing How to Teach Your Children Shakespeare and hosting the giveaway. All opinions are my own, and I was not required to give a favorable review. My guest was not compensated and her opinions are her own. “To be or not to be.” “The course of true love never did run smooth.” “All the world’s a stage.” The language, characters, and stories of William Shakespeare have far-reaching influence for us today in our books, our pop culture, and even our everyday conversations. But despite all this Shakespeare all around us, many of us are still left scratching our heads and wondering how in the world to begin studying the Bard with our students. 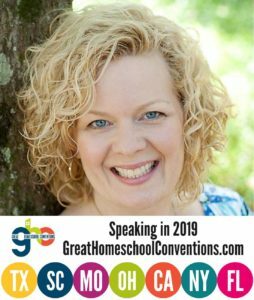 We are joined today on the podcast by homeschool grad, homeschool mom, and avid Shakespeare lover, Mystie Winkler of Simply Convivial. 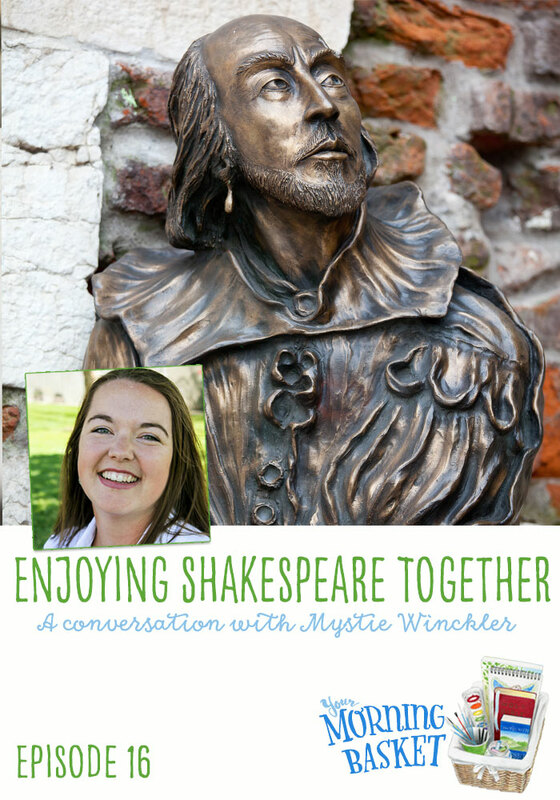 Mystie describes how, in just a few minutes a couple of times a week, we can share Shakespeare with our children and create in them not only a familiarity with his work, but also a taste for the beauty of his poetry. When we focus on experiencing, enjoying, and embodying Shakespeare by memorizing passages, watching plays, and maybe even acting out a few scenes ourselves, we can foster a lifelong affection for this beloved figure in English literature. The Basket Bonus for today’s show is a procedure list from Mystie on studying Shakespeare. 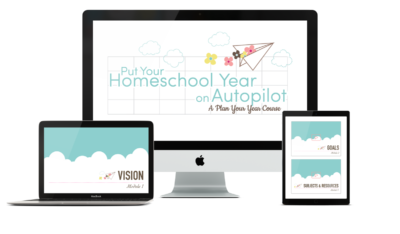 Get the exact method she uses in one easy printable for your Morning Time binder. Also win your very own copy of How to Teach Your Children Shakespeare by Ken Ludwig. Check the bottom of this post for a chance to win. 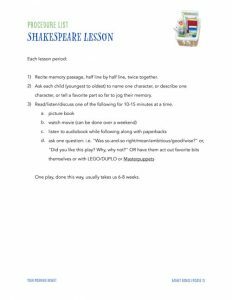 Check out this Shakespeare Lesson Procedure from Mystie! Win your very own copy of How to Teach Your Children Shakespeare by entering below. Ten copies are available to win and Ken said he would mail anywhere in the world, so international entries are welcome. I’ve never read Shakespeare. I know some of the stories. I grew up in France & it was never taught in my schools. The question is how to make the language accessible? Not only gor my child but for myself? I hope this helps! Bon courage! What plays are best to start with when you begin? You mentioned picture books for Shakespeare. Is there a list of these somewhere? ‘Can’t thank you enough for this post! I’d already purchased the Ludwig book, in anticipation of beginning Shakespeare. 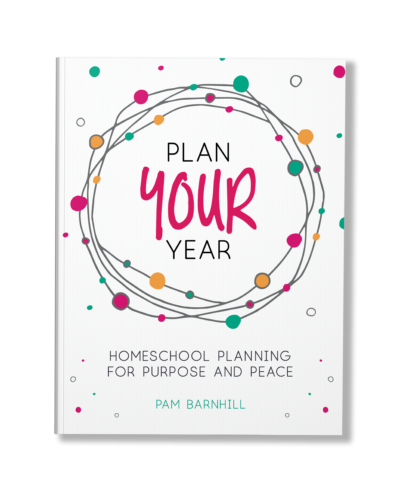 This offered a great way to introduce it into our school year . Blessings. Great podcast. I am just finishing up doing Twelfth Night with our homeschool co-op. I had kids from 13 and to high school. We worked our way through the memory passages from Ken Ludwig’s books most of the kids memorized at least 3 passages and with a small handful who ended up memorizing all 7. I know many of the kids weren’t very excited about the class, but I’ve enjoyed watching many of them decide that Shakespeare isn’t that bad! I’d love a link to the “King” DVDs that Mystie mentioned in the podcast. I wanted to pass along another great Shakespeare resource: it’s called Shakespeare in Bits and is an App or online animated video program that has the complete play acted out on one half of the screen and then the text (with clickable notes, character info, plot summaries, etc) on the other half of the screen. You can also click the text over to “modern” language. It’s a great way to see/read/hear Shakespeare performed all at once! They have about 7 plays done already and I hope they do more!! We have loved the Julius Caesar so far!! I’ve seen those! Glad to have an endorsement. Just went back and listened to this one again in preparation for the coming school year. Love the practical and very doable method that Mystic uses in her home. Going to implement something similar in the fall and can’t wait! 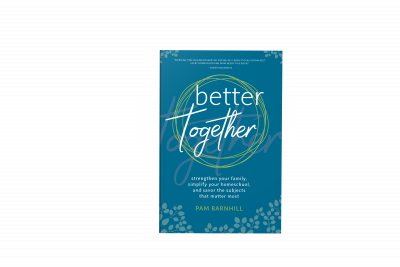 Thank you so much, Pam and Mystie! !